We started to make this wine for the first time in 2008, mostly using grapes from the Herrenweg and Turckheim area, so mostly gravely and granitic soils. The idea was clearly to obtain a dry wine (by Alsace standard it means <5g/l RS) so we could write plain and clear on the front label. It also means that we have to be extremely careful with the harvest date, not to pick too late and avoid by all means any noble rot. 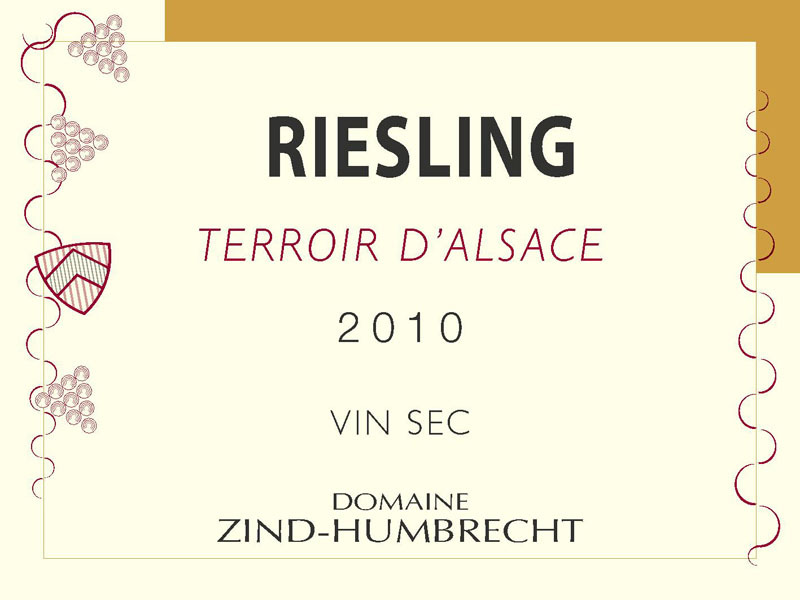 In 2010 this was quite easy for most Riesling and the general high sharp acidity also helps to give a very dry structure to the wines. The fermentation lasted over a year but eventually was completed before Christmas 2011! 3/2012: the nose is extremely mineral and still strongly influenced by a very long total lees contact. The autolysis must have been complete as the nose shows strong iodine, flinty and sea air characteristics. The palate starts very sharp and the strong acidity increases the sensation of dryness. Beware, this tastes very dry! The elegant style of the Riesling grape eventually comes around on the finish with a nice sensation of salt. This wine can benefit from more ageing.